1 A None No Power Seat 1 A is designated as an Economy Class Comfort seat that has extra legroom due to the exit row ahead. Reserving this seat is available for an additional fee. The proximity to the galley and lavatory may be bothersome. The tray table is in the armrest, making the armrest immovable and slightly reducing seat width. There is no floor storage during takeoff and landing. 1 B None No Power Seat 1 B is a standard Economy Class seat that has extra legroom due to the exit row ahead. The proximity to the galley and lavatory may be bothersome. The tray table is in the armrest, making the armrest immovable and slightly reducing seat width. There is no floor storage during takeoff and landing. 1 C None No Power Seat 1 C is a standard Economy Class seat that has extra legroom due to the exit row ahead. The proximity to the galley and lavatory may be bothersome. The tray table is in the armrest, making the armrest immovable and slightly reducing seat width. There is no floor storage during takeoff and landing. 11 A None No Power Seat 11 A is a standard Economy Class seat that has extra legroom due to the exit row ahead but it has limited recline due to the exit row behind. The tray table is in the armrest, making the armrest immovable and slightly reducing seat width. There is no floor storage during takeoff and landing. There is no window-side armrest, which can be uncomfortable. 11 B None No Power Seat 11 B is a standard Economy Class seat that has extra legroom due to the exit row ahead but it has limited recline due to the exit row behind. The tray table is in the armrest, making the armrest immovable and slightly reducing seat width. There is no floor storage during takeoff and landing. There is no window-side armrest, which can be uncomfortable. 11 C None No Power Seat 11 C is a standard Economy Class seat that has extra legroom due to the exit row ahead but it has limited recline due to the exit row behind. The tray table is in the armrest, making the armrest immovable and slightly reducing seat width. There is no floor storage during takeoff and landing. There is no window-side armrest, which can be uncomfortable. 11 D None No Power Seat 11 D is a standard Economy Class seat that has extra legroom due to the exit row ahead but it has limited recline due to the exit row behind. The tray table is in the armrest, making the armrest immovable and slightly reducing seat width. There is no floor storage during takeoff and landing. There is no window-side armrest, which can be uncomfortable. 11 E None No Power Seat 11 E is a standard Economy Class seat that has extra legroom due to the exit row ahead but it has limited recline due to the exit row behind. The tray table is in the armrest, making the armrest immovable and slightly reducing seat width. There is no floor storage during takeoff and landing. There is no window-side armrest, which can be uncomfortable. 12 A None No Power Seat 12 A is a standard Economy Class seat has extra legroom due to the exit row ahead. The tray table is in the armrest, making the armrest immovable and slightly reducing seat width. There is no floor storage during takeoff and landing. 12 B None No Power Seat 12 B is a standard Economy Class seat has extra legroom due to the exit row ahead. The tray table is in the armrest, making the armrest immovable and slightly reducing seat width. There is no floor storage during takeoff and landing. 12 C None No Power Seat 12 C is a standard Economy Class seat has extra legroom due to the exit row ahead. The tray table is in the armrest, making the armrest immovable and slightly reducing seat width. There is no floor storage during takeoff and landing. 12 D None No Power Seat 12 D is a standard Economy Class seat has extra legroom due to the exit row ahead. The tray table is in the armrest, making the armrest immovable and slightly reducing seat width. There is no floor storage during takeoff and landing. 12 E None No Power Seat 12 E is a standard Economy Class seat has extra legroom due to the exit row ahead. The tray table is in the armrest, making the armrest immovable and slightly reducing seat width. There is no floor storage during takeoff and landing. 12 F None No Power Seat 12 F is a standard Economy Class seat has extra legroom due to the exit row ahead. The tray table is in the armrest, making the armrest immovable and slightly reducing seat width. There is no floor storage during takeoff and landing. 2 A None No Power Seat 2 A is designated as an Economy Class Comfort seat that offers additional legroom. Reserving this seat is available for an additional fee. 2 B None No Power Seat 2 B is designated as an Economy Class Comfort seat that offers additional legroom. Reserving this seat is available for an additional fee. 2 C None No Power Seat 2 C is designated as an Economy Class Comfort seat that offers additional legroom. Reserving this seat is available for an additional fee. 2 D None No Power Seat 2 D is designated as an Economy Class Comfort seat that may have limited legroom due to the bulkhead. Reserving this seat is available for an additional fee. The proximity to the galley may be bothersome. The tray table is in the armrest, making the armrest immovable and slightly reducing seat width. There may be no floor storage during takeoff and landing. 2 E None No Power Seat 2 E is designated as an Economy Class Comfort seat that may have limited legroom due to the bulkhead. Reserving this seat is available for an additional fee. The proximity to the galley may be bothersome. The tray table is in the armrest, making the armrest immovable and slightly reducing seat width. There may be no floor storage during takeoff and landing. 2 F None No Power Seat 2 F is designated as an Economy Class Comfort seat that may have limited legroom due to the bulkhead. Reserving this seat is available for an additional fee. The proximity to the galley may be bothersome. The tray table is in the armrest, making the armrest immovable and slightly reducing seat width. There may be no floor storage during takeoff and landing. 3 A None No Power Seat 3 A is designated as an Economy Class Comfort seat that offers additional legroom. Reserving this seat is available for an additional fee. 3 B None No Power Seat 3 B is designated as an Economy Class Comfort seat that offers additional legroom. Reserving this seat is available for an additional fee. 3 C None No Power Seat 3 C is designated as an Economy Class Comfort seat that offers additional legroom. Reserving this seat is available for an additional fee. 3 D None No Power Seat 3 D is designated as an Economy Class Comfort seat that offers additional legroom. Reserving this seat is available for an additional fee. 3 E None No Power Seat 3 E is designated as an Economy Class Comfort seat that offers additional legroom. Reserving this seat is available for an additional fee. 3 F None No Power Seat 3 F is designated as an Economy Class Comfort seat that offers additional legroom. Reserving this seat is available for an additional fee. 4 A None No Power Seat 4 A is designated as an Economy Class Comfort seat that offers additional legroom. Reserving this seat is available for an additional fee. 4 B None No Power Seat 4 B is designated as an Economy Class Comfort seat that offers additional legroom. Reserving this seat is available for an additional fee. 4 C None No Power Seat 4 C is designated as an Economy Class Comfort seat that offers additional legroom. Reserving this seat is available for an additional fee. 4 D None No Power Seat 4 D is designated as an Economy Class Comfort seat that offers additional legroom. Reserving this seat is available for an additional fee. 4 E None No Power Seat 4 E is designated as an Economy Class Comfort seat that offers additional legroom. Reserving this seat is available for an additional fee. 4 F None No Power Seat 4 F is designated as an Economy Class Comfort seat that offers additional legroom. Reserving this seat is available for an additional fee. 5 A None No Power Seat 5 A is designated as an Economy Class Comfort seat that offers additional legroom. Reserving this seat is available for an additional fee. 5 B None No Power Seat 5 B is designated as an Economy Class Comfort seat that offers additional legroom. Reserving this seat is available for an additional fee. 5 C None No Power Seat 5 C is designated as an Economy Class Comfort seat that offers additional legroom. Reserving this seat is available for an additional fee. 5 D None No Power Seat 5 D is designated as an Economy Class Comfort seat that offers additional legroom. Reserving this seat is available for an additional fee. 5 E None No Power Seat 5 E is designated as an Economy Class Comfort seat that offers additional legroom. Reserving this seat is available for an additional fee. 5 F None No Power Seat 5 F is designated as an Economy Class Comfort seat that offers additional legroom. Reserving this seat is available for an additional fee. 6 A None No Power Seat 6 A is designated as an Economy Class Comfort seat that offers additional legroom. Reserving this seat is available for an additional fee. 6 B None No Power Seat 6 B is designated as an Economy Class Comfort seat that offers additional legroom. Reserving this seat is available for an additional fee. 6 C None No Power Seat 6 C is designated as an Economy Class Comfort seat that offers additional legroom. Reserving this seat is available for an additional fee. 6 D None No Power Seat 6 D is designated as an Economy Class Comfort seat that offers additional legroom. Reserving this seat is available for an additional fee. 6 E None No Power Seat 6 E is designated as an Economy Class Comfort seat that offers additional legroom. Reserving this seat is available for an additional fee. 6 F None No Power Seat 6 F is designated as an Economy Class Comfort seat that offers additional legroom. Reserving this seat is available for an additional fee. 7 A None No Power Seat 7 A is designated as an Economy Class Comfort seat that offers additional legroom. Reserving this seat is available for an additional fee. 7 B None No Power Seat 7 B is designated as an Economy Class Comfort seat that offers additional legroom. Reserving this seat is available for an additional fee. 7 C None No Power Seat 7 C is designated as an Economy Class Comfort seat that offers additional legroom. Reserving this seat is available for an additional fee. 7 D None No Power Seat 7 D is designated as an Economy Class Comfort seat that offers additional legroom. Reserving this seat is available for an additional fee. 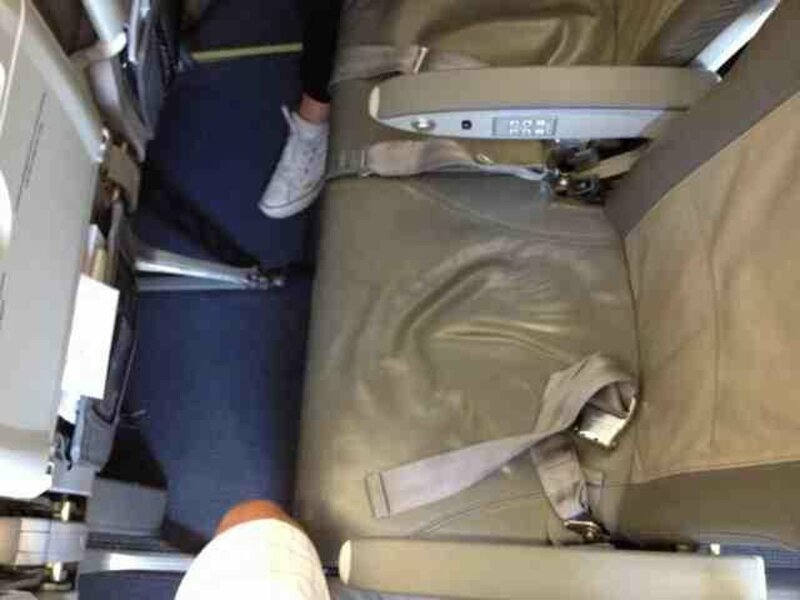 7 E None No Power Seat 7 E is designated as an Economy Class Comfort seat that offers additional legroom. Reserving this seat is available for an additional fee. 7 F None No Power Seat 7 F is designated as an Economy Class Comfort seat that offers additional legroom. Reserving this seat is available for an additional fee. 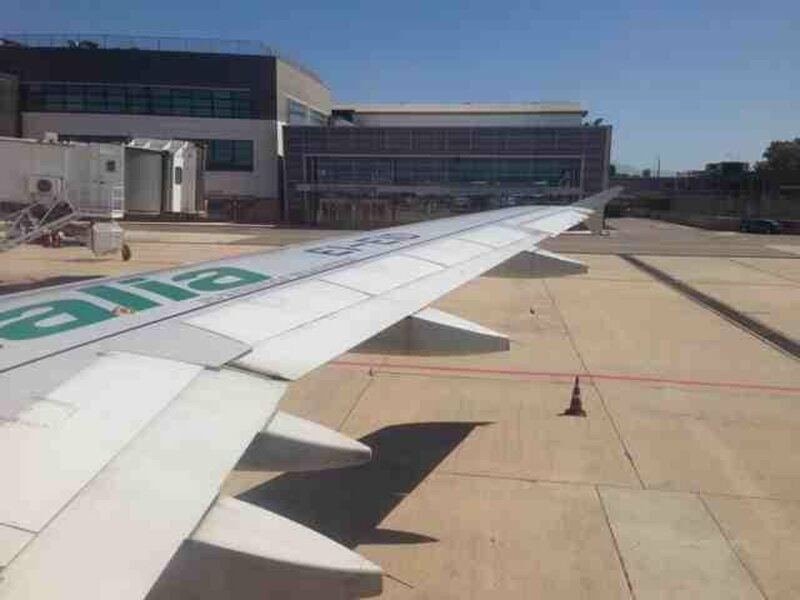 The A320s in the Alitalia fleet are used on short and medium-haul flights. These planes cruise at a speed of 460 kts and have a range of 2400nm. 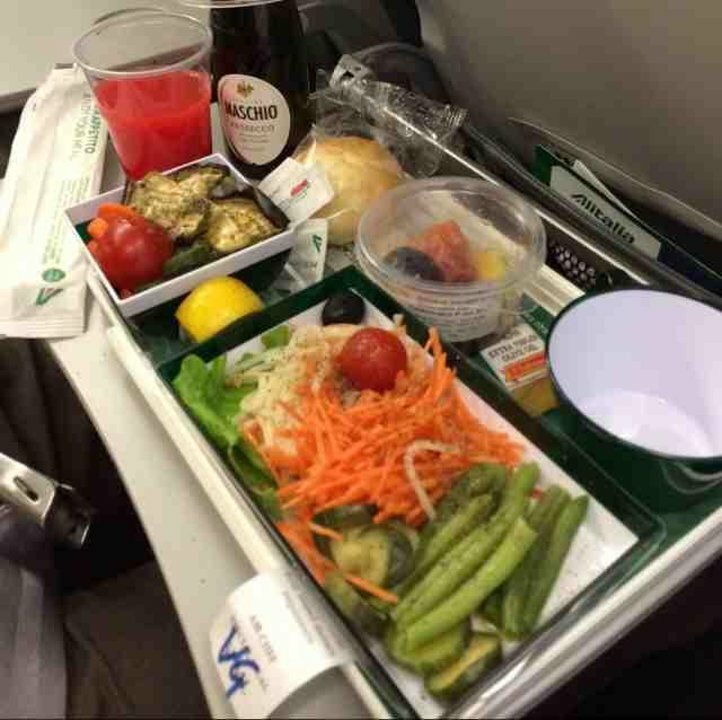 Alitalia flies two versions of this aircraft: a single class version with all Economy Class seats, including Economy Class Comfort seats which may be reserved for an additional fee, and a two class version with both Economy and Business Class seats. This plane is the single class version and it flies solely with 165 Economy Class seats. Super tight row, no space for legs at all even for short people. The rows before and after are fine. Horrible! 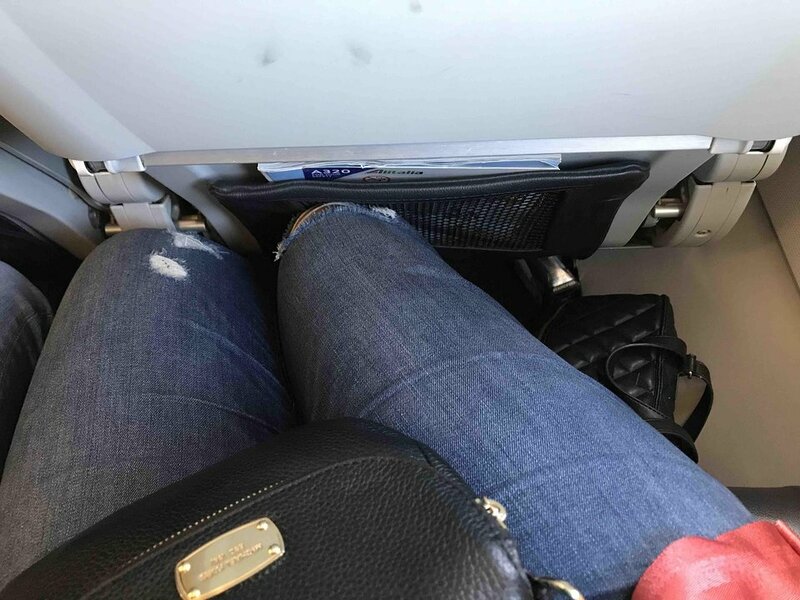 The legroom was so little, I could sit "normally" with my 1.85 m I am not small, but certainly not tall either. 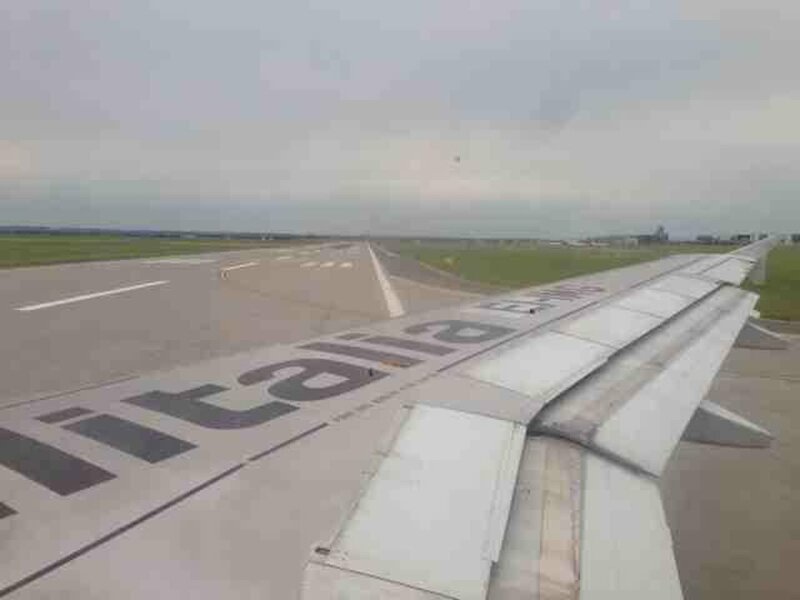 I reminded me on a ryanair flight I once took. NOT Skyteam worthy !